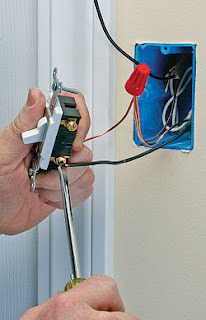 Adding, moving or relocating electrical boxes and fixtures in a building is difficult. It is often impossible considering concrete walls and ceiling. Most board of directors have stringent guidelines regulating as to what renovation and alteration an owner can or cannot do or require a prior approval of the board. Please consider the following BEFORE calling us unless it is a troubleshooting issue, light installation or similar minor repair. Parking labyrinths, access, navigation, delays and waiting for passes, elevators, etc. make the same job in a tall building 20% to 50% more time consuming for the electrician, hence more expensive for you. If you renovated a house before, be prepared to pay more for the same job in a condominium.